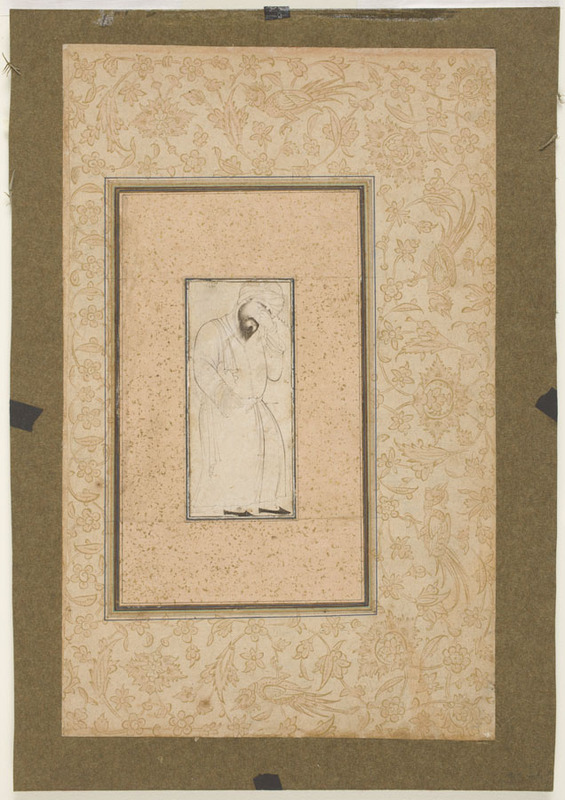 Too large to be a preliminary sketch for a manuscript painting, this superb drawing is a moving example of the single-figure studies that became popular at the sixteenth-century Safavid court. It is attributable to Shaykh Muhammad, who was responsible for paintings in some of the best royal manuscripts of that time, as well as many independent single-page works. The hallmarks of his style in the present drawing include the spiraling turban folds and "viscerally" bunched sleeve drapery of the weeper's robe. Shaykh Muhammad's tenure in the Safavid royal atelier came after the death of the older painter Bihzad, whose name was inscribed here for profit or prestige at a later date. The signature of Bihzad, the most famous Persian miniature painter, is found on many works postdating his career of the late fifteenth and early sixteenth century.